The only one in its category in New Zealand, this machine keeps its cool when the heat is on…and so does its operator. Jenny Pretorius reports. Once Kevin Wakeford from KA Wakeford Ltd gets into his Takeuchi TB290 excavator, things happen. Some things heat up, some things break down, and yet other things cannot but submit completely to the irresistible force he exerts over them. There is no problem with falling into or having to dig himself out of holes - he can handle any tricky holes and similar potentially-hazardous situations from a safe distance and has a proven record of successfully manoeuvring himself out of the tightest corners. Wakeford, from Browns Bay, Auckland, self-employed since the age of 18, has been working as private general civil contractor specialising in space constrained work the past 25 years. One of his main contracts is with Pacific Steel Group in Otahuhu. Other Otahuhu contracts include general excavations and demolitions in often hard-to-reach areas. To understand the challenges of his tasks at Pacific Steel, an understanding of the steel making process is necessary. Pacific Steel Group, the country's largest metal recycler, turns over 300,000 tonnes of scrap metal into 100% recycled steel each year. The recycling process comprises seven steps. First, venture partner Sims Pacific Metals sorts and shreds the scrap, which is then placed in graded and sized piles in the Pacific Steel yard. Next, the scrap is loaded by a grab crane into baskets. Each recycle event or 'heat' uses three basket loads of scrap. The target is 50 tonnes of steel per heat. Now, the first basket is lowered over the electric arc furnace and the scrap dropped in. An electrical current combines with chemical energy to heat the scrap to a near molten state. The second and final baskets are added. This progressive process allows all the scrap to fit in one heat. Following this, Pacific operators inject oxygen and carbon into the furnace. The process takes the molten metal to a base level, enabling slag, a mixture of undesirable impurities, to form on the top of molten steel. The slag on the steel bubbles off the top of the heat and is collected in a slag pit below. This slag is removed, processed, and reused as high-grade roading material. 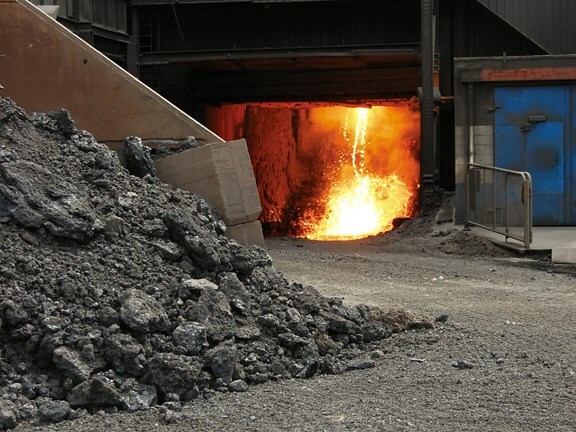 Then, when the steel temperature is around 1620˚C, the molten steel is poured into a ladle. This is called tapping. 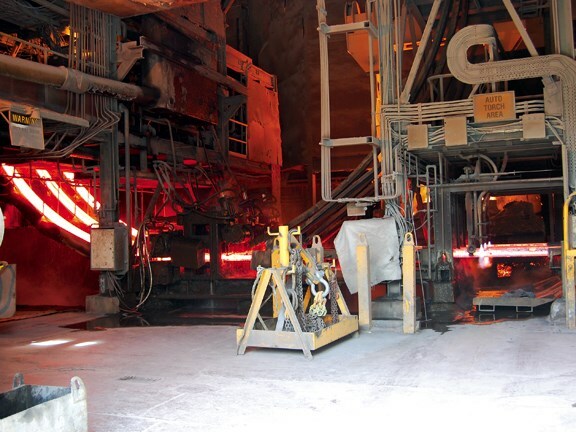 During the tapping process operators add lime, manganese, silicon, carbon, and vanadium depending on what type of steel is being made. 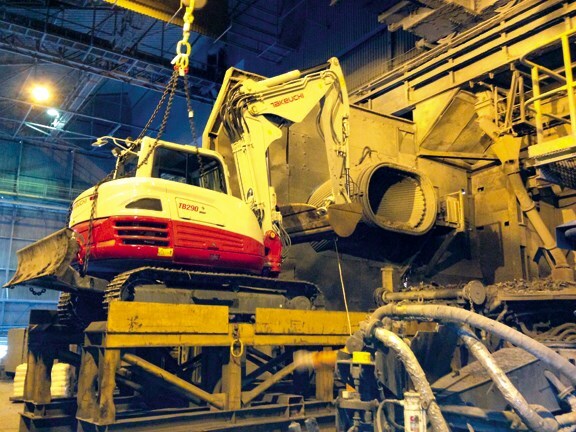 A crane transports the ladle to the refining station, where more additives are added to achieve the specification of the grade of steel being made. Argon gas now bubbles through the ladle to help remove remaining impurities. This process creates lime debris, which collects in a pit under the ladles, and is subsequently removed to huge lime debris heaps. The debris contains significant scrap steel content. 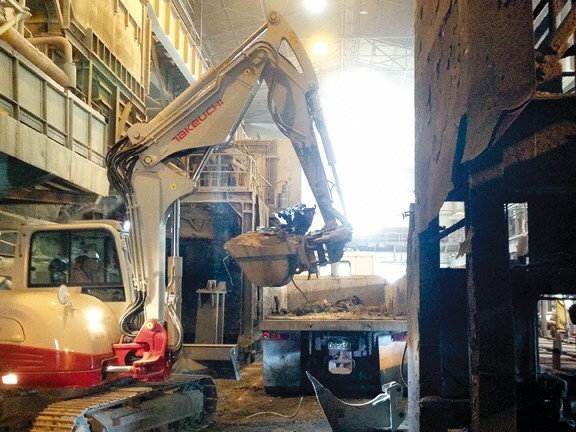 Finally, once the steel specification is confirmed the ladle is transported again by crane to the continuous casting area and processing into products can begin. Wakeford's Pacific Steel contract provides for three tasks. He does maintenance work cleaning the electric arc furnace during weekends. He also wrecks the ladles, or removes the fire-proof brick lining, called the refractory, and slag crusts from their insides. In addition, he also sorts through the lime debris heaps, removing scrap steel and returning it to the furnace for recycling. 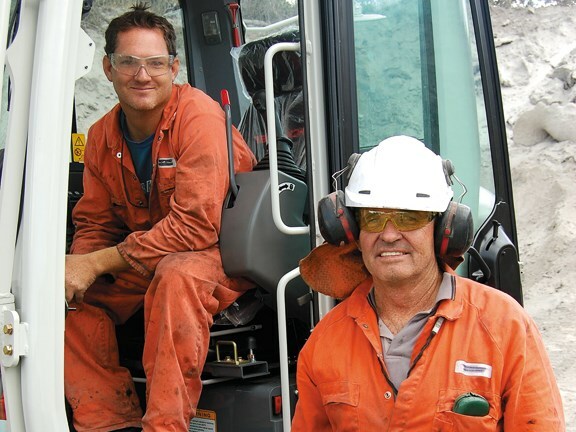 Two excavators help Wakeford and his son-in-law Ian MacDougall to accomplish this work. 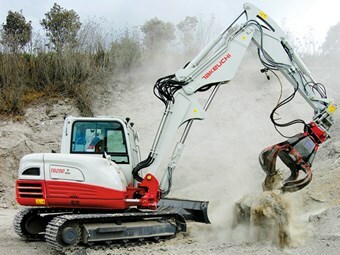 However, Wakeford and the Takeuchi TB290, bought two months ago from New Zealand Equipment Group (NZEG), take the brunt of the work, or in this instance, the heat, and, Wakeford says the Takeuchi does so with admirable cool. When the time came to replace one of his excavators, he had a comprehensive wish list of the tolerances he wanted his new machine to achieve. He researched his options over 12 months. Assisted by NZEG's sales manager Garry Jackison, with whom he shares a long-standing goodwill relationship, he decided on the Takeuchi TB290 — the first Takeuchi in its category to come into the country. Eight weeks after delivery, Wakeford considers his acquisition a very smart move. "It's doing what I thought it would do. I'm very happy with its performance, and it's up to my expectations, indeed exceeding them. The buying process was easy, Garry was very helpful. NZEG's training and back-up service has been excellent," he comments. Wakeford explains the stresses to which he subjects the machine in the course of its tasks and how the Takeuchi bears them. For furnace cleaning, a crane lifts the excavator onto a purpose built 1.5m-high, 8m x 2.5m platform. 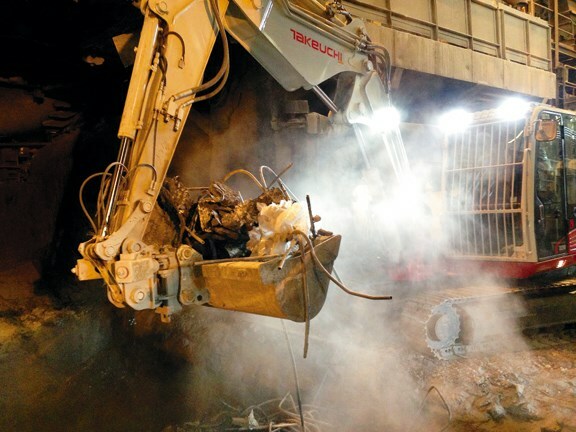 The TB290's two-piece boom — one of the drivers of Wakeford's decision — gives the machine the ability to manoeuvre over the rim and down to the far reaches of the furnace floor for the purpose of ripping and removing slag and debris from within. He then manoeuvres the machine on the platform so he can run to its far end to release the debris into the slag pit below. He says the grunt the (51.4Kw / 2,000min-1) Isuzu AU-4JJ1TYSB-03 4/4 cycle engine gives the machine means it punches above its weight, while it is light and compact enough to move and work in restricted spaces. The slag pit is very hot, enough to have cracked windows and melted hoses and plastics on the previous excavator from time to time on this task. But leave the slag too long, and it becomes a solid mass needing to be broken into manageable fragments with the rock breaker attachment on the Takeuchi TB290 excavator to enable the rubber tyre loader to remove the material. "It is an extremely harsh and confined environment to work in due to the heat and material contaminants. It's a major task breaking the slag lumps with the rock breaker. The TB290's compact size, stability, and configuration make it easier," Wakeford says. Wakeford and Jackison were hoping the Takeuchi's air conditioning system, which can now direct cold air flow in any desired direction, notably onto all glass surfaces in the cab, would keep the glass from cracking and breaking, "…and the operator from getting so hot under the collar!" So far, so good Wakeford says. Reaching down into the hot pit with the heavy rock breaker attached to the boom, or lifting heavy loads out with the bucket, means the excavator's balance can be tenuous. Wakeford is very pleased with the way the Takeuchi behaves. "Its centre of gravity is perfectly placed. It's heavy for its small footprint, which gives it good stability," he says. The refractory bricks lining the ladles have a limit of about 120 heats. 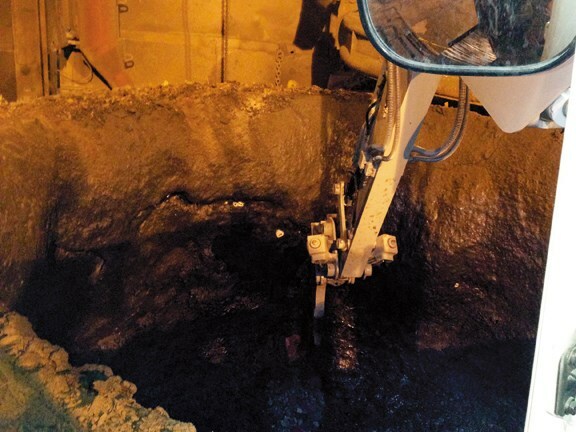 Wakeford uses the rock breaker attachment to remove them, too. International specialist Pyrotec rebuilds the lining and it's off to work again. When it is time to retrieve scrap steel from the lime heaps, the excavator's two-piece boom also comes into its own. The lime heaps can be up to 10m high, which Wakeford then has to scoop down to a workable height he can manage easier. The boom can reach eight metres up and seven metres out from the centre of the machine, allowing the excavator to stay at a safe distance from potential hazards. 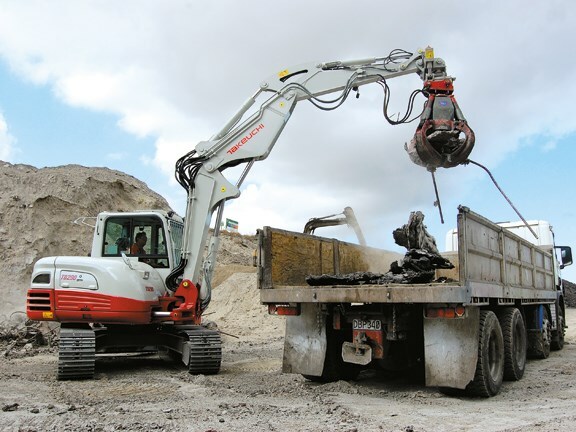 Huge metal scraps and rocks can be picked from the lime debris immediately with the Italian-made Euromech Magnetic Grab four-arm grapple Wakeford attaches to the Takeuchi for this work. The grapple has a magnet incorporated into its head. A screen attachment on the TB290 separates big scrap steel and rock from smaller material. Wakeford then picks the remains of the heaps over with the magnet, resulting in an eventual 95% recovery of the lime heap's steel scraps. These go on the back of his Scania 124 eight-wheeler, back to the stock pile to be recycled. "The 2T-Euromech attachment, especially with the boom extending at full reach, can tax stability. 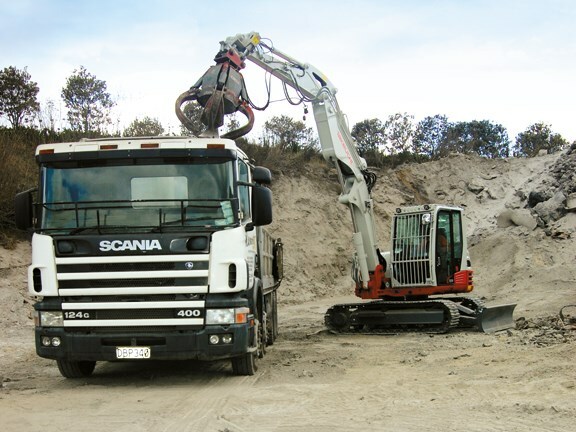 However, even I was surprised to see how well the Takeuchi performs under these loads — extremely well for a machine its size," Jackison says. "The two-piece boom works well. It's simpler than the telescopic boom it replaces and helps improve the stability of the machine. Although it reduces digging depth to 4.5m, the reach and height more than compensates. The extra height makes a huge difference in tight spaces, loading over high-sided trucks, and demolition work. It's awesome," Wakeford adds. Jackison, who has spent many years in developing countries and knows what a reliable machine looks, sounds, and feels like is very pleased Wakeford's new Takeuchi hit the sweet spot. "He chose this excavator essentially for its stability, reach, durability, and compactness — and he got everything he wanted and more for his very taxing job. "Our brands really are world class. 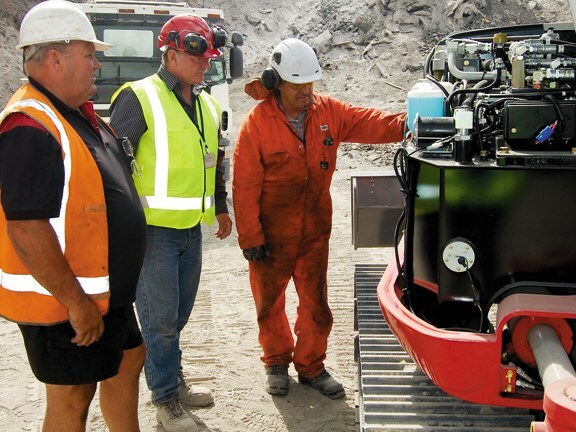 Takeuchi, the first manufacturer to build mini excavators, has been around since 1962 and is now arguably New Zealand's leading mini excavator," says Jackison. For the latest reviews, subscribe to our Deals On Wheels magazine here .